As a designer, I play with perception a lot. How human brains perceive their environments fascinates me to no end. I ran this gem last September and six months later it still amazes me. I mean wow. It's an animated, inanimate object. Well, I came upon two more good illusions on Twitter the other day. A web developer who writes Indigo Thoughts reprinted this one from Scientific American. Click on each of the graphics below, this will bring up a much larger image in a new browser. Hold a finger in front of your nose and focus intently on it. 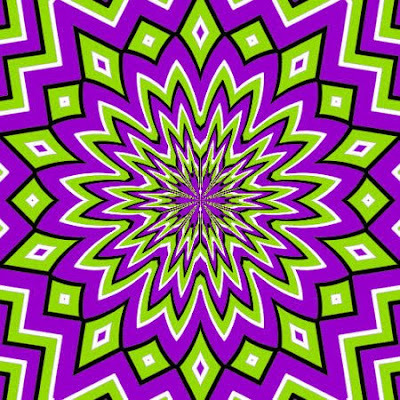 This will cross your eyes. On your screen you will see three boxes. 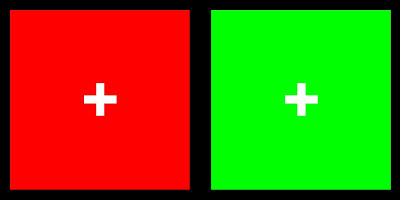 The middle box will show the impossible color, a bluish yellow or a reddish green. Make sure the crosses line up. Can you see yellowish blue? Can you see reddish green ? 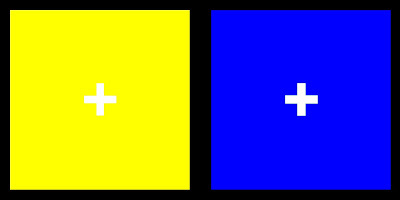 These exercises illustrate what are called impossible colors. Reddish green and yellowish blue are not the brown and green you'd expect them to be. Rather they are what they're called. These illusions takes a little bit of concentration to master but when you do master them you'll be observing a gaping flaw in your eyes' and brain's ability to process color. These impossible colors illustrate the opponent process and you can read more about it here. Could you get the second illusion to work? My little girl was up in the middle of the night sick. That first picture is what my brain feels like this morning. I get an afterimage of that first one that persists for a good ten minutes after I make it go away. That thing's crazy! I think I need to reread this post Paul in the morning when I have some caffeine on board. I think you owe me some advil! I am fascinated by how this works but my brain is wired to want to BEAT IT . So, I am throwing in the towel and going to bed. Cheryl: You can't beat it, that's what's so cool. Those -ish colors run smack into the realities of your anatomy, physiology and perception. Elizabeth: In honor of your kids I'll do it. Hah! Actually, if you want to delve into something deep with them, click on the link in the story about the opposition process and be amazed. That the cones in my eyes would follow a simple, binary program makes perfect sense and catching the three known binary programs red-handed is beyond cool. Thanks for the compliments about the new look around here.